Stephanie Boyd for reviewing prior to publication. The people of Cajamarca, in the northern highlands of Peru, are descended from the Incas, whose empire unified previous indigenous groups such as the Caxamarca, Chavín, Moche (Mochica) and Chimú. They now call themselves campesinos (peasant farmers), due to the stigma still associated with indigenous identity. However, there are marked continuities in the way the people live off the land: pre-Incan groups had already established large-scale societies with advanced agricultural practices, and today the residents are still farmers of quinoa, potatoes, maize and beans, to name only a few of the crops that grow in this varied climate of multiple altitudes. There is also a long tradition of herding llamas, alpacas and sheep. Although Cajamarquinos have largely taken on the political and linguistic structures of Spanish-Peruvian culture, their religious practices still contain traces of the past, blending pre-Incan, Incan, Catholic and evangelical Protestant faiths. In a region with such an enduring relationship between cultural subsistence and the land, it is no surprise that spirituality remains tied to the mountains and the water. Pre-Incan religion appears to have been primarily earth-based. The people worshipped a pantheon of nature spirits associated with mountains, bodies of water, or other natural formations. From this period comes the term huaca, which refers to these spirits or physical manifestations of the sacred such as rock cairns or temples. When the Incas united what is present-day Peru, and parts of Ecuador, Bolivia, Chile and Argentina, they absorbed these huacas into their state religion. Along with the well-known Inca cult of the sun, for example, people might worship the creator god Pachacamac and earth mother Pachamama. The Inca also borrowed and adapted origin stories from local cultures featuring ancestors who emerge out of caves or rocks. So, each local group was linked to a natural feature out of which their ancestors were born. From these creation stories and agricultural practices arose belief in a reciprocal relationship between humans and the natural world. The hybrid spiritual practices of the Andean people evolved further when the Spanish conquered the Incas and forced Catholicism upon them. Mountain spirits in particular were believed to watch over specific areas, ensuring water supply and the health of animal herds. Cerro (Mount) Quilish, one of the most important mountains in Cajamarca, has long been regarded as a god that has provided water to its children since pre-Incan times. In the village of Porcón, where residents (Porconeros) still speak the Inca language of Quechua, the community holds a ritual procession to the mountain during periods of drought. Porconeros carry images of Catholic saints, most prominently Cristo Ramos, to Cerro Quilish and chant prayers to ask for water. The dark clouds that announce the coming of the rain are said to be the spirit of Quilish answering their prayers. Curanderos (Andean shamans) still consider Quilish and other mountains of the region, notably Carachugo and Maqui Maqui, to be sacred places where they conduct rituals, such as tributes to Mother Earth and exorcisms of evil spirits. Curanderos also collect medicinal herbs, but are concerned that these plants are disappearing. The clash between gold and indigenous culture in the region began when the Spanish conquistador Francisco Pizarro arrived in 1532 and demanded gold from the Inca Emperor Atahualpa. According to local history, Pizarro held Atahualpa hostage until Atahualpa promised to fill the room with gold as high as his arms could reach, which he believed would win his release. Upon delivery of the gold in 1533, a Jesuit priest told Atahualpa that he still would not be freed until he converted to Catholicism. Atahualpa refused and the Jesuits killed him. While gold was highly valued in Inca society — much of the gold brought in response to Atahualpa’s order reportedly came from a temple to Pachacamac — it was his culture that the emperor refused to give up. Many campesinos saw the multinational partnership that began mining at Yanacocha in 1992 as simply the newest incarnation of colonizers, always greedy for gold. Newmont’s extraction of the precious metal does not just make the company profits; the harm done to the land forces another kind of conversion on the residents, from a sustainable lifestyle evolved over centuries, to the immediate boon of short-term jobs in a resource extraction industry. 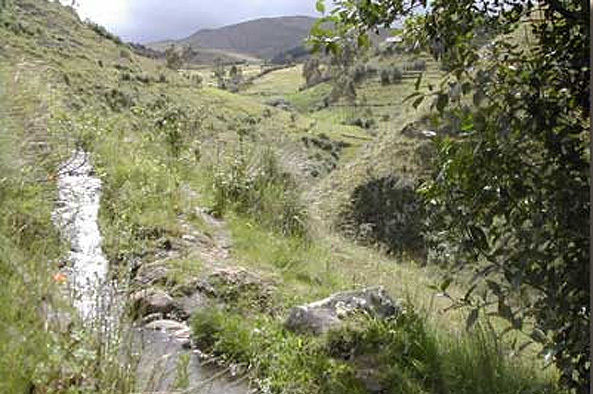 In 1990, Yanacocha began buying property in the highlands of Cajamarca. Many residents sold land without a full understanding of the extent or value of the gold hidden in the mountains. When the mine opened two years later, the people in this impoverished area welcomed the mine because of the job opportunities it promised, and accompanying infrastructure such as improved roads. However, almost immediately, residents began to notice changes in the environment: streams began to dry up and the water that remained was polluted. As they learned, the campesinos’ most precious resource is also essential for cyanide heap-leach mines. When gold is found in tiny traces, as it is in Yanacocha, the mining process involves digging up enormous amounts of rock — half a million tons per day — and leaching the gold out with a combination cyanide-water solution. If not properly contained, the poisonous liquid runs off into pure surface and ground water. It takes 30 tons of rock to produce an ounce of gold, and thus the mine consumes entire mountainsides. Yanacocha currently covers 22,000 acres and is the second largest mine in the world. Meanwhile, it is constantly seeking to expand. This low-cost but environmentally hazardous method is also used in Shoshone territory in Nevada and has been proposed for Indian Pass in California. Other people from around Peru moved to the area in hopes of landing a job and their presence led to overcrowding and an increase in crime. Agriculture has become more difficult because local farms depend on the water that comes from the mountains being mined. Fish and animals have been harmed and farmers are continually pressured to sell their land to the expanding mine. Cultural treasures like the ancient roads of the Incas and archaeological sites are being destroyed. In 2000, campesinos were directly confronted with the dangers of living with toxic chemicals, when they endured what has been labeled the world’s largest mercury spill. A truck that was hauling away canisters of mercury, a byproduct of cyanide gold mining, spilled 330 pounds of the poisonous metal on a road running through the towns of Choropampa, Magdalena and San Juan, 53 miles from the mine. Thinking the mercury contained gold, thousands of villagers took pieces of it home, some cooking it on their stoves. The result was mercury poisoning: impaired hearing and vision, central nervous system disorders, birth defects, miscarriages, and liver and kidney damage. The Peruvian government fined Yanacocha $500,000 for an incident it initially tried to downplay. The mine eventually offered to pay some restitution if the townspeople would sign documents clearing the mining company of further responsibility. But more than 1,100 residents decided instead to file a class action lawsuit against Newmont. The suit is still pending. This was not the first high profile legal dispute Newmont faced. Yanacocha was initially founded by a partnership of the American company Newmont, the Peruvian company Buenaventura, and a French government-owned company, Bureau de Recherches Géologiques et Minières (BRGM). These partners were later joined by the World Bank. Conflict arose when BRGM decided to sell most of its share to Normandy Poseidon, an Australian company. Newmont filed suit in Peruvian court, claiming that BRGM could not sell to a new company without first offering its shares to the original stakeholders. The lower courts ruled in favor of Newmont, but the Peruvian Supreme Court agreed to review the decision. Peruvian courts were notoriously corrupt at the time and Newmont suspected that the French government had intervened in an attempt to get a favorable ruling. Newmont representative Larry Kurlander went to talk with a high-level Peruvian official who had a reputation for bribery, and their conversation was captured on videotape as part of a larger corruption scandal that brought down the government of former Peruvian President Alberto Fujimori. While Newmont denies any illegal influence, the Supreme Court eventually voted to allow Newmont to buy out BRGM at a bargain price in 1998. Now, Newmont owns the majority of the mine, with smaller shares controlled by Buenaventura and the World Bank. Neither the United States Foreign Corrupt Practices Act, which forbids American companies from bribing officials of foreign governments, nor the World Bank’s unit on fraud and corruption has been brought to bear on this case. Today, Newmont is the world’s largest gold mining company, with interests in Ghana, Indonesia, Romania and the United States. Peru remains Newmont’s self-proclaimed “crown jewel,” contributing 22 percent of the seven million equity ounces of gold the company sold in 2004. While Newmont has similar operations all over the world, it can get away with varying safety standards, depending on the host country. In Indonesia, Newmont dumps mine waste directly into the ocean and has filed a defamation lawsuit against an Indonesian professor who spoke out against the resulting environmental damage. Newmont has begun plans for two new mines in Ghana and Romania, which would force thousands of residents off their land. In Romania, the effects of the proposed mine on an important agricultural area would be severe enough that the European Parliament has warned that Romania may not be able to join the European Union if the mine is approved and constructed — and the World Bank has refused to finance the mine. Akyem, the proposed mine in Ghana, is to be located in a forest reserve and is scheduled to begin production in 2007. Demands for accountability and community consultation in Cajamarca continue. After Newmont admitted to 36,700 missing fish from a contaminated river, the World Bank commissioned a study of all waterways around the mine. The agency concluded that the water was safe for human consumption in the short term, but it is only a matter of time until enough acid builds up to contaminate the water. The report concluded that “perpetual treatment” would be needed. Newmont assures regulators that starting in 2007 it will put away money to pay for future clean-up, but this promise only heightens the company’s desire to increase profits. Newmont recently proposed expanding their gold mining onto the sacred Cerro Quilish, four miles from the existing mine. Mount Quilish contains a potential 3.8 million ounces of gold. Local officials had already designated Quilish and its watershed a protected natural reserve in 2000, reflecting the mountain’s status as a prime source of water to the region. However, Newmont argued before a Peruvian court that its mining rights predated the protected area status and the court agreed that Newmont could move ahead with plans to tear down the mountain. In August 2004, villagers formed a blockade of vehicles and boulders across the road leading to Yanacocha. The confrontation between villagers and hundreds of armed officers quickly turned violent. Villagers — including many women and elders — were arrested and sprayed with tear gas. One man was shot. Newmont kept Yanacocha open by flying workers in via helicopter. 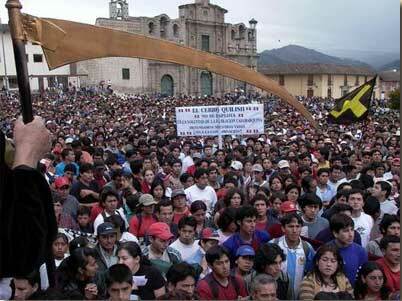 The protest grew in the streets of Cajamarca over the following two weeks, ultimately drawing 10,000 people. In November 2004, Newmont backed down. Shortly thereafter, local newspapers printed a statement by the company acknowledging its lack of consultation with the community. A small wall made of mud and straw still stands on the mountain, a reminder of the collective protest that stopped the company. The combined weight of the corruption allegations, the mercury spill, the environmental reports, and the protests at Cerro Quilish have made Newmont somewhat more accountable to the community. The mine now operates under U.S. safety standards, not just Peruvian ones, in addition to the safety improvements that followed the internal 2001 audit. Newmont has stepped in to deliver many social services that it says the local government is not providing, contributing a total of $20 million directly to the community to fund schools, clinics and village water treatment plants. But the halt in Newmont’s expansion was temporary. Losing the revenue from Cerro Quilish only increased the need for the company to find other gold reserves. A drilling team is currently investigating the highlands near San Cerillo, another area that stores water used by the region. Residents, and the local activist group Grufides, remain concerned — and Newmont’s use of police protection for the drilling team is a sign of how seriously the company takes community opposition. The community’s main concern remains its water supply, both quantity and quality. Local activist Father Marco Arana says that the company’s current standard of testing the water every three weeks does not restore the community’s confidence because testing protocols and results are not reviewed independently. By the end of the mine’s life cycle, much of the billion tons of rock and soil that Newmont is expected to have unearthed will be full of acids and chemicals. Cyanide heap-leach mining may bring a short-term boost to the local economy, but in the end, Newmont will leave and Cajamarquinos will be left with poisoned land. Educate yourself and your friends and colleagues about where gold comes from and the price paid by local communities. Take the “No Dirty Gold” pledge, stay informed about gold mining, and participate in action campaigns to raise awareness. Contact Newmont Mining to encourage them to work with native communities and let them know that American citizens are watching its actions abroad. Spanish speakers may contact GRUFIDES to find out about supporting their work. Boyd, Stephanie. “Lies and Videotape.” New Internationalist, July 2003. Grupo de Formación e Intervención para el Desarrollo Sostenible. GRUFIDES.org. Earthworks. “Cajamarca, Peru.” No Dirty Gold. Guarango Association. “Choropampa, the Price of Gold.” Guarango. Perlez, Jane and Lowell Bergman. “Treasure of Yanacocha: Tangled Strands in Fight Over Peru Gold Mine.” The New York Times, October 25, 2005.